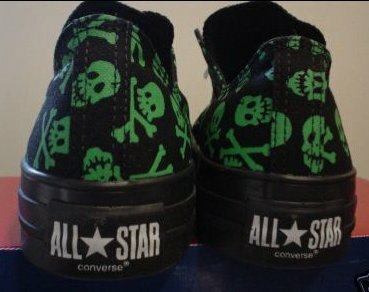 Photo gallery of chucks with commercial pattern print uppers. 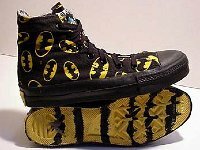 1 Chucks With Commercial Pattern Uppers Batman high tops, angled side view. 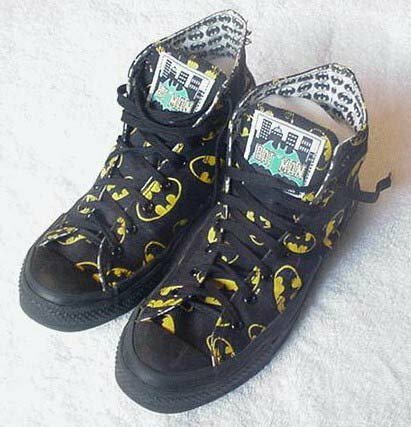 2 Chucks With Commercial Pattern Uppers Inside patch view of a Batman lantern logo high top. 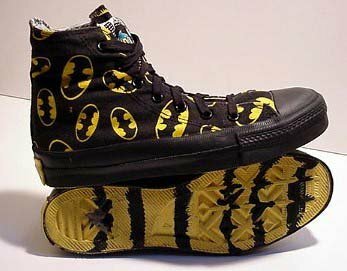 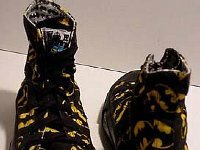 3 Chucks With Commercial Pattern Uppers Batman high tops, sole view showing black stripes. 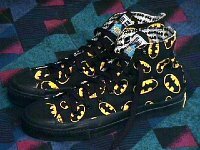 4 Chucks With Commercial Pattern Uppers Batman high tops, angled top view. 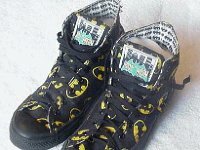 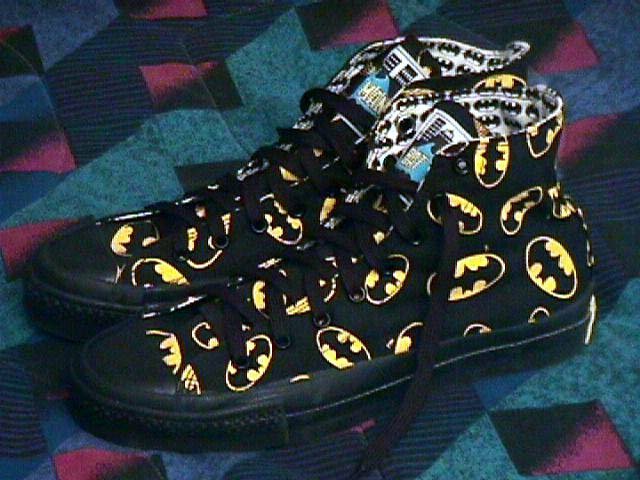 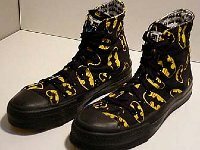 5 Chucks With Commercial Pattern Uppers Batman high tops, angled side view. 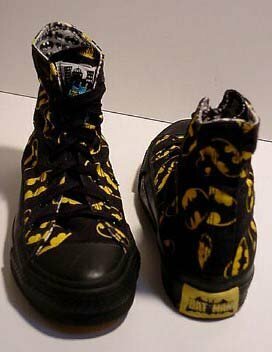 6 Chucks With Commercial Pattern Uppers Batman high tops, front and rear patch views. 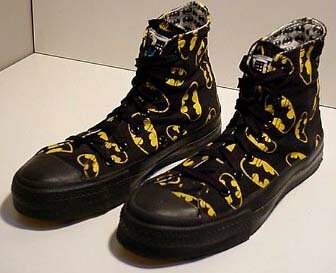 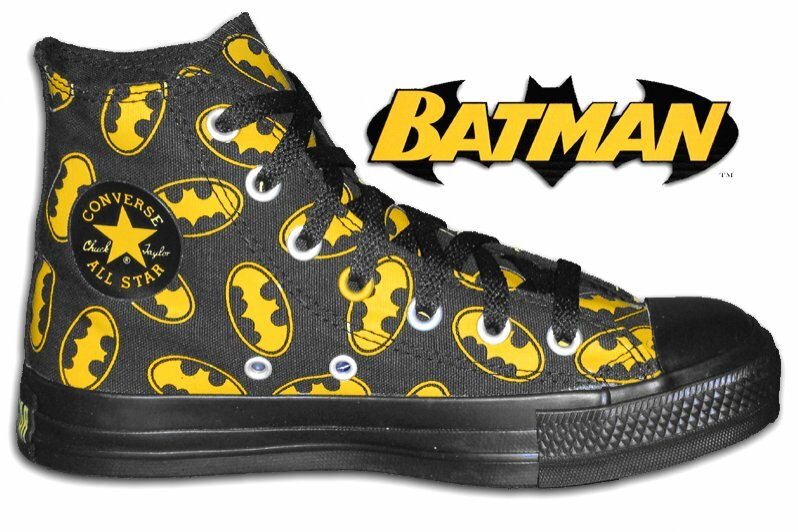 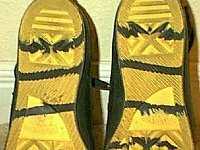 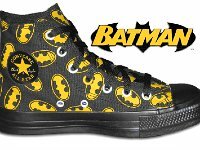 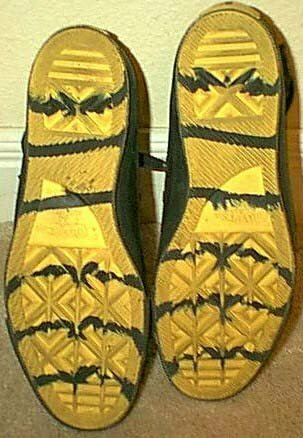 7 Chucks With Commercial Pattern Uppers Batman high tops, outside and sole views. 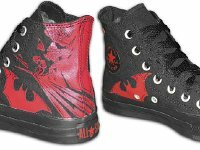 8 Chucks With Commercial Pattern Uppers Angled side of view of black and red Batman pattern high tops. 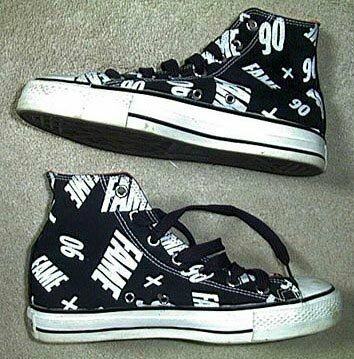 9 Chucks With Commercial Pattern Uppers 1990 Fame pattern high tops, with black laces. 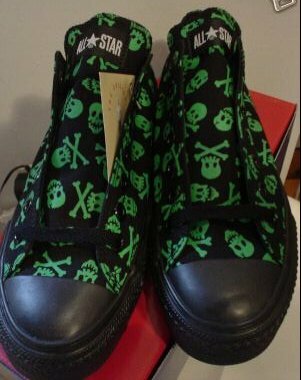 10 Chucks With Commercial Pattern Uppers Rear view of green and black Jackass high tops. 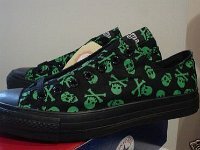 11 Chucks With Commercial Pattern Uppers Side view of green and black Jackass low cuts. 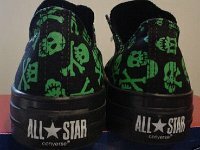 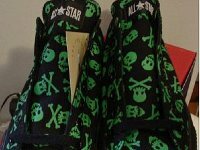 12 Chucks With Commercial Pattern Uppers Top view of green and black Jackass logo high tops. 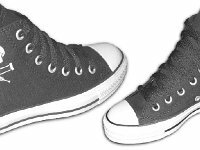 13 Chucks With Commercial Pattern Uppers Angled side views of black canvas Jackass high tops. 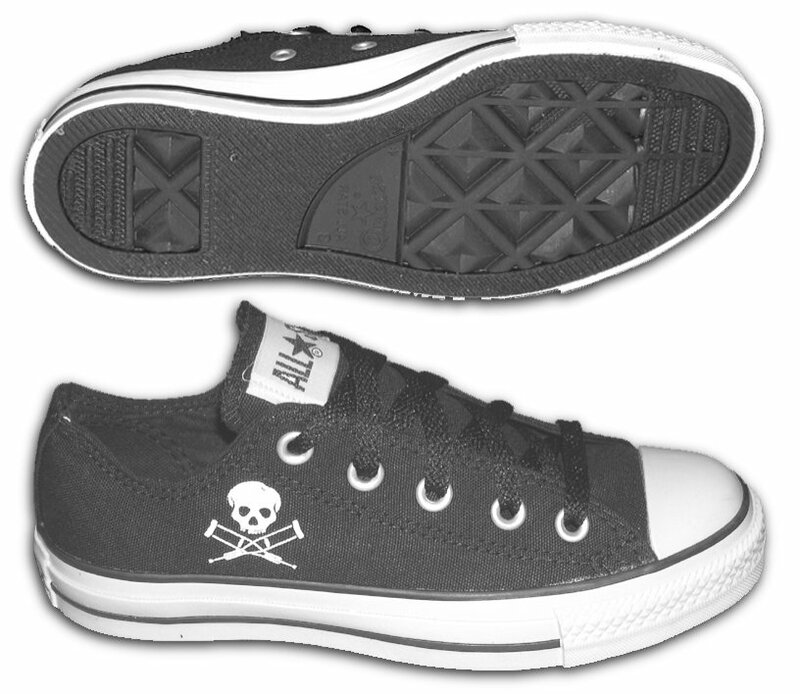 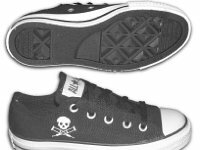 14 Chucks With Commercial Pattern Uppers Side and sole views of black canvas Jackass low cuts. 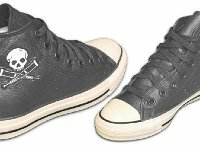 15 Chucks With Commercial Pattern Uppers Angled side views of black leather Jackass high tops. 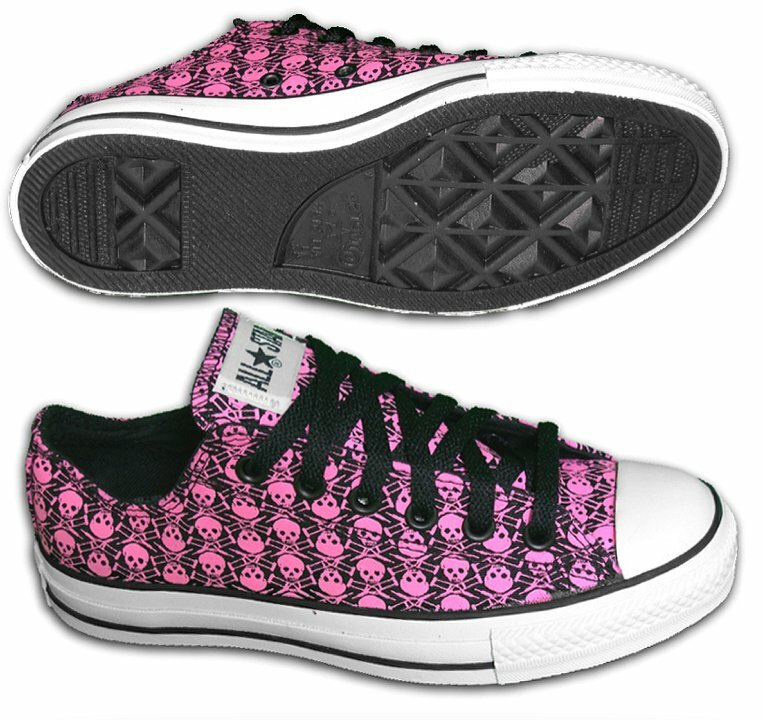 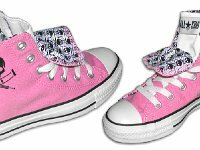 16 Chucks With Commercial Pattern Uppers Side and sole views of pink and black Jackass low cuts. 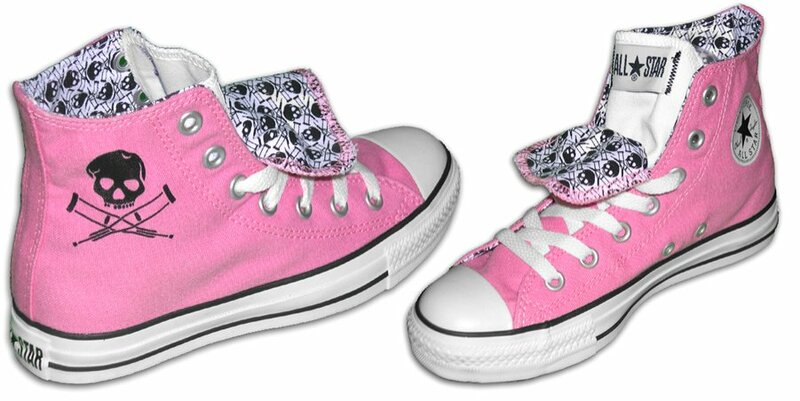 17 Chucks With Commercial Pattern Uppers Angled side views of pink double upper Jackass high tops. 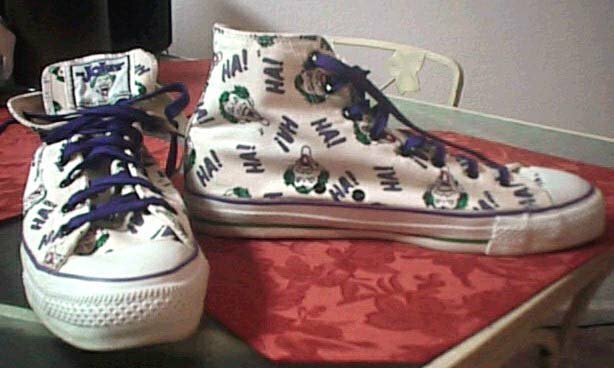 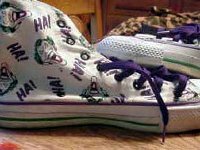 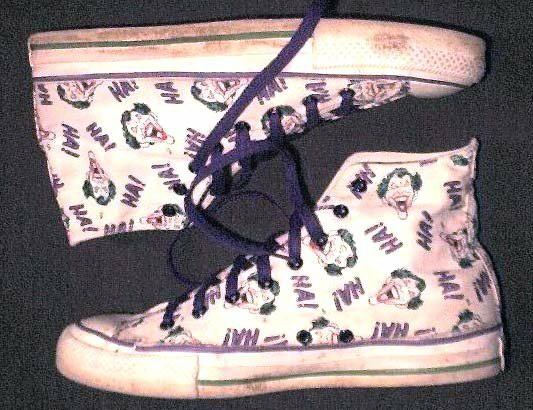 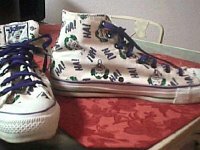 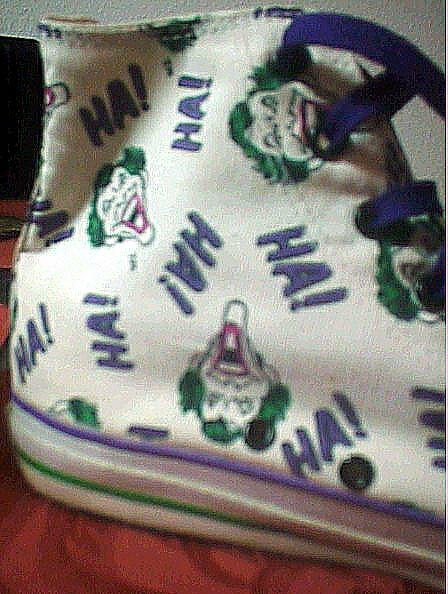 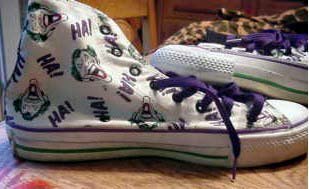 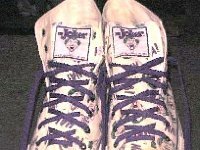 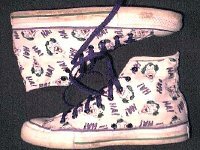 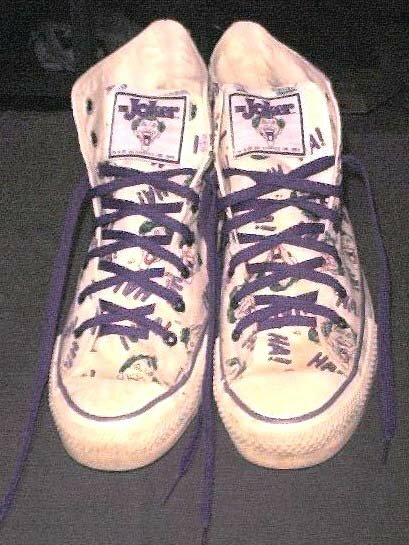 18 Chucks With Commercial Pattern Uppers Joker high tops (from the Batman series), outside view. 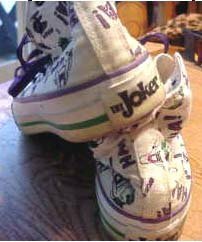 19 Chucks With Commercial Pattern Uppers Worn Joker high tops, top view from the front. 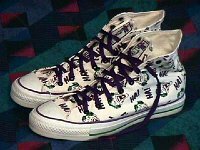 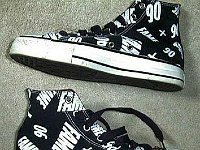 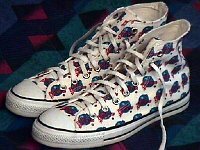 20 Chucks With Commercial Pattern Uppers Worn Joker pattern high tops, outside views. 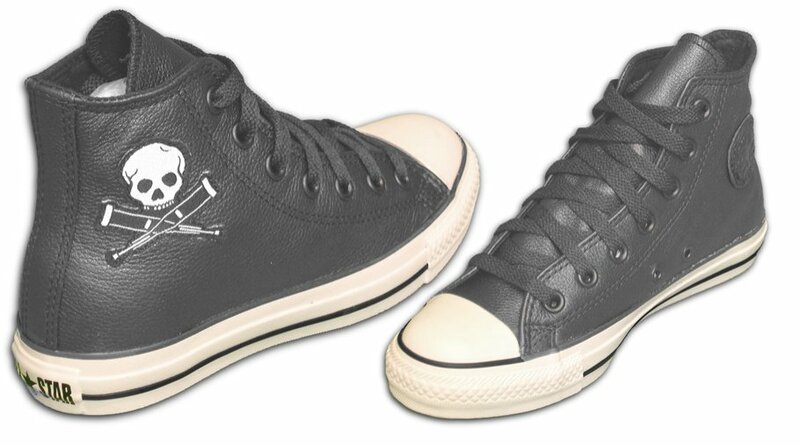 21 Chucks With Commercial Pattern Uppers Joke high tops, rear patch views. 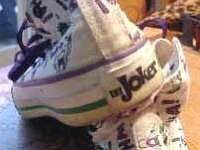 22 Chucks With Commercial Pattern Uppers Joker high tops, side view. 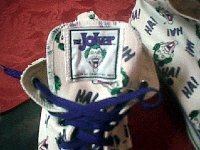 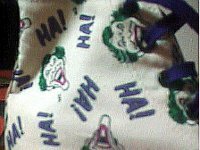 23 Chucks With Commercial Pattern Uppers Close up of Joker high tops, showing the Joker patch on the tongue. 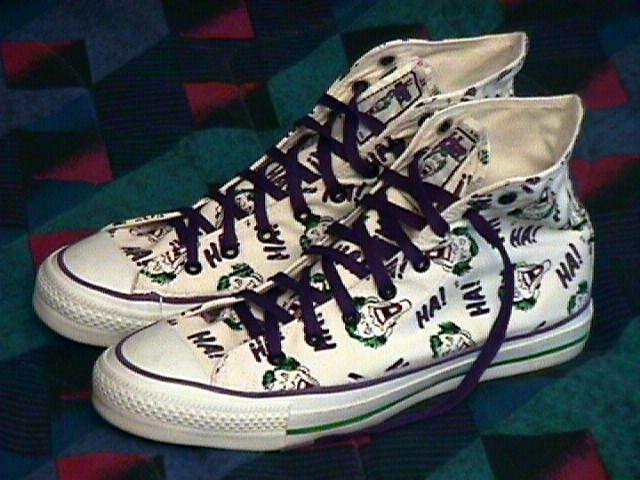 24 Chucks With Commercial Pattern Uppers Joker high tops, showing front and side views. 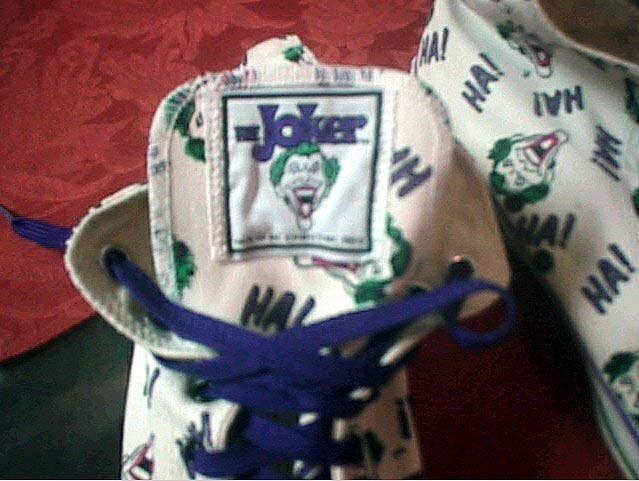 25 Chucks With Commercial Pattern Uppers Joker high top, closeup of the print. 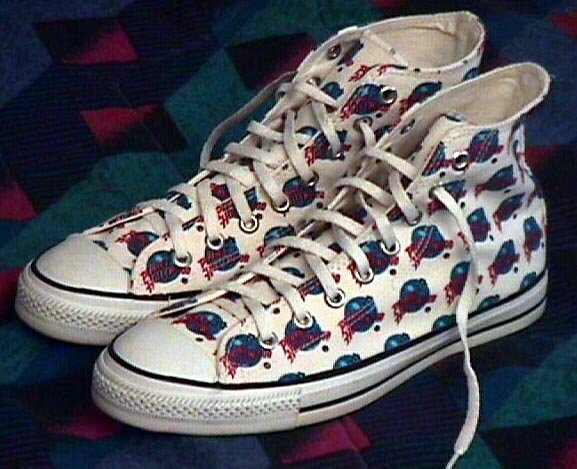 26 Chucks With Commercial Pattern Uppers Planet Hollywood pattern high tops, angled outside view.